This short post was originally published on the now-defunct website Worldchanging.com, in 2007. The story of Chydenius serves as a good reminder of the importance of maintaining a free press and the right of public access to government information — principles that seem increasingly under attack around the world. The text has been slightly updated. In 2016, the Finland-based Anders Chydenius Foundation celebrated the 250th anniversary of the world’s first Freedom of Information Act. Sweden and Finland were one big empire in those days, and the Swedish-Finnish law — passed in 1766, two hundred years before a similar law was passed by the U.S. Congress and ensuring open access to all government papers and other kinds of information under a “principle of public access” — was largely the product of one man’s visionary ethical ideas. Even in this super-connected age, news sometimes travels slow. While you probably never heard of him, Chydenius was an inspiring, world-changing figure. His ideas about openness and freedom have had a big impact on your life — and they continue to do so, especially every time you read the news. New Sustainability “Model Calendar” for 2015! If you are expecting photo-models, think again. This wonderful 2015 wall calendar — produced by the folks at Stockholm Resilience Center and Beijer Institute for Ecological Economics — is about conceptual models, the kinds of diagrams and think-pieces that help us understand the world. And it is a gem. 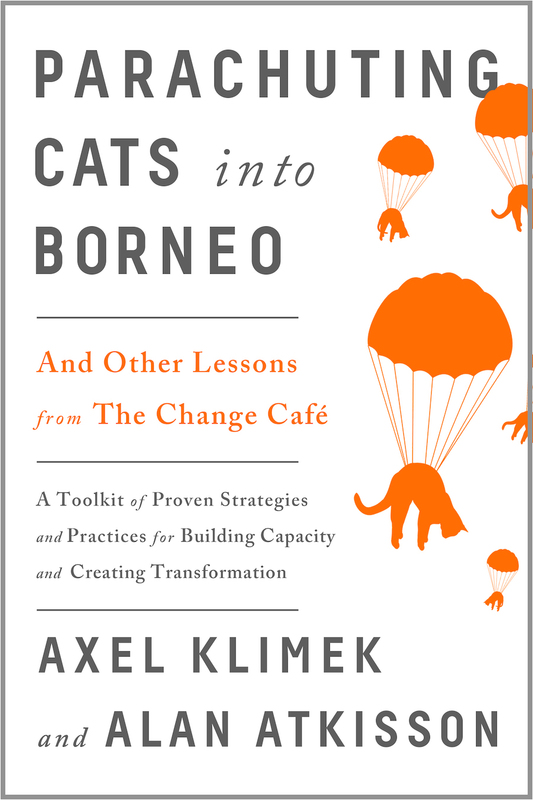 Here you will find twelve essential intellectual tools for thinking about sustainability, ecosystems, social systems, and resilience. They are briefly described, elegantly illustrated … and will get you googling to find out more about your favorites. If you’re into this stuff, anyway! Thanks to Jamila Haider at SRC, who shared this digital copy with me and gave me permission to share it with my friends … Enjoy! Note: A different, chattier version of this post was sent to WaveFront newsletter readers. The eight-point summary is the same. To read WaveFront, sign up at www.AtKisson.com. Since the essay is behind a paywall, I provide a bare-bones summary below. 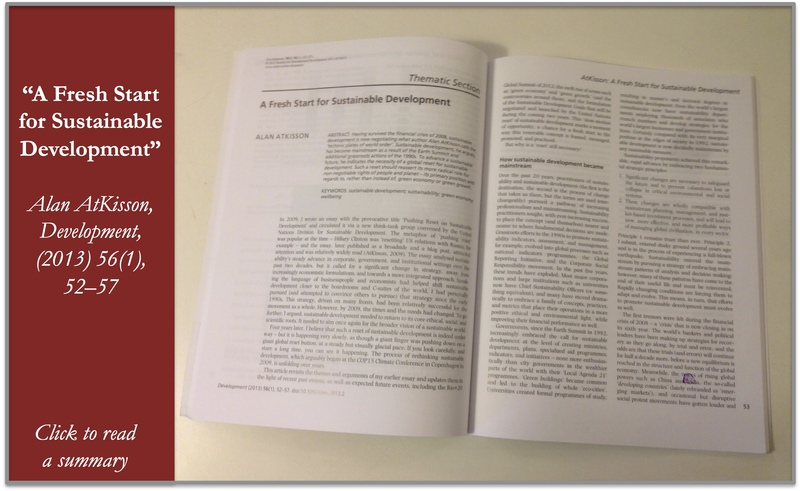 If you need a copy of the full essay, and cannot access Development, write to information [[ at ]] atkisson.com. Sustainable Development is in the process of being reconsidered and restarted, very slowly, “as though a giant finger was pushing down on a giant global reset button, at a steady but visually glacial pace.” You can see this happening from the global level (e.g. the UN Sustainable Development Goals) all the way down to the local level (e.g. Transition Towns). This is timely. Sustainability became mainstream in recent years by (1) making the risks of non-sustainability clear, and (2) speaking the language of economics and management, and proposing that sustainable development could be achieved through reforms to business as usual, with economic benefits. I promoted this strategy, as did many others, and it has been successful. But this strategy has run its course. The rise of the “Green Economy” and “Green Growth” — one of the manifestations of sustainability’s success in pursuing the above mainstreaming strategy — is a necessary, but far from sufficient, condition for achieving true sustainable development. Wellbeing, equity, freedom and opportunity are equally important. Sustainability needs to return to its roots. It is a set of ambitious and idealistic — not “realistic” — goals, that include the eradication of poverty, the transformation of the global energy system, gender equality, peace. These ultimate goals probably cannot be achieved through “business as usual.” Transformation, not mere reform, is needed. Sustainability’s goals may be radical, but they are not marginal. “They are enshrined in numerous global agreement texts, including Rio+20’s The Future We Want” [one of several UN texts agreed to by the all the world’s governments]. A vision for sustainability based in transformation and aiming for ultimate, idealistic goals means that the work is far from over. There is tremendous learning to be done, great adherence to ethics required, lots of hard work to do — but essential, exciting work — in the decades ahead. The following was originally composed as a set of notes for use by Junko Edahiro, who writes a monthly newsletter on happiness and wellbeing issues in Japan. See the website of her Institute, ISHES, for more info. My own summer vacation, spent mostly in Sweden and the United States, has been a happy one … but the summer has also produced a lot of interesting news about happiness, wellbeing, and alternatives to traditional economic growth, in both countries. Let’s start with the US. First came a special Summer Double Issue of Time Magazine, which had “The Pursuit of Happiness” as a cover story (July 8/July 15, 2015). Several articles detailed what makes Americans happy, and compared US results with the results of surveys in other countries: the US ended up 23rd on a list of 50 countries. It also reported on fascinating genetic and neurological research that suggests Americans are more pre-disposed to be happy … because the country is made up of immigrants. People who move, seek novelty, and exhibit other “forward-looking behavior” are also more likely to be happy and optimistic, and there are certain genetic markers for these and related traits that show up more often in Americans. Anyway, it turns out that searching for new things is also one of the behaviors that is most likely to be correlated with happiness: the article called it “the joy of pursuit.” We are happier when searching for things than when we find them! The articles also covered the relationship between money and happiness, and noted that “money can indeed buy happiness, at least in certain circumstances.” And within limits. Doubling your salary from US$ 75,000 to 150,000 does not make people twice as happy … but it *does* make them happier, say current research findings. Of course, your money-related happiness also depends on comparisons with neighbors, as everyone (including researchers!) already knows. But in the age of social media, things get complicated, because now the whole world is your neighbor … and you don’t just compare cars or houses. You compare Twitter followers. Meanwhile, the whole Sharing Economy has now come to the attention of the most prominent sustainability voice in the US mainstream media — that is, Thomas Friedman. While Friedman is often “late to the party” on topics like this (he tends to “discover” things years after other people have written about them), what he does is bring the full weight of the New York Times to bear. And he also writes brilliantly. So his article about the Share Economy and how it is shaking up normal consumer markets is really worth reading, even if you already know a lot about this topic. In my other home country, Sweden, there has been a noticeable increase in the amount of attention and writing focused on alternatives to the GDP. A lead editorial in Dagens Nyheter (DN, the leading daily newspaper) took up the issue of measuring wellbeing, specifically the new study by Ida Kubiszewski, Robert Costanza and others, which looks at the Genuine Progress Indicator (GPI) over several decades. Kubiszewski et al. concluded that GPI — which subtracts environmental and social costs from traditional GDP measures (among other innovative features) — peaked globally in 1978 but since then has gone down, even though GDP has increased. Rising income inequality and increasing environmental degradation were the chief culprits. The debate that DN calls for received a big jolt forward with the recent publication of a new book in Sweden (available only in Swedish) called “Swearing in Church: 24 Voices about Endless Growth on a Finite Planet.”* To “swear in church” is a Swedish phrase that underscores the fact that criticizing growth is essentially sacrilegious in Western society: you don’t do it. So the “twenty-four voices” assembled in this volume of essays are themselves a statement, because they represent a wonderful diverse and prominent sample of Swedish society, from Anders Wijkman (well known political figure and current global chairman of the Club of Rome) to Stina Oscarson (who runs the Swedish national radio theater) to Pär Holmgren (a famous TV weatherman and climate change educator) and Fredrik Lindström (a much-loved TV personality and language critic). That all of them were willing to “swear in church” about the problem of unending economic growth, and that they did it together in the same volume, speaks volumes. We will see how much impact the book actually makes … but I take it as an excellent indicator that I was first introduced to the book by my Swedish mother-in-law, who had it lying around on the coffee table at the family’s summer place, on the island of Gotland. She knew about the book before I did. As an extended family, we tend to spend our summer days on Gotland doing … well, not much. Lying on the beach. Talking. Playing volleyball. Cooking dinner. Most of which costs relatively little money, in pure GDP terms. But ah, yes, it certainly does make us happy. On Thursday 16 May, I attended an excellent public seminar on the power of indicators and numbers in the context of sustainable development. 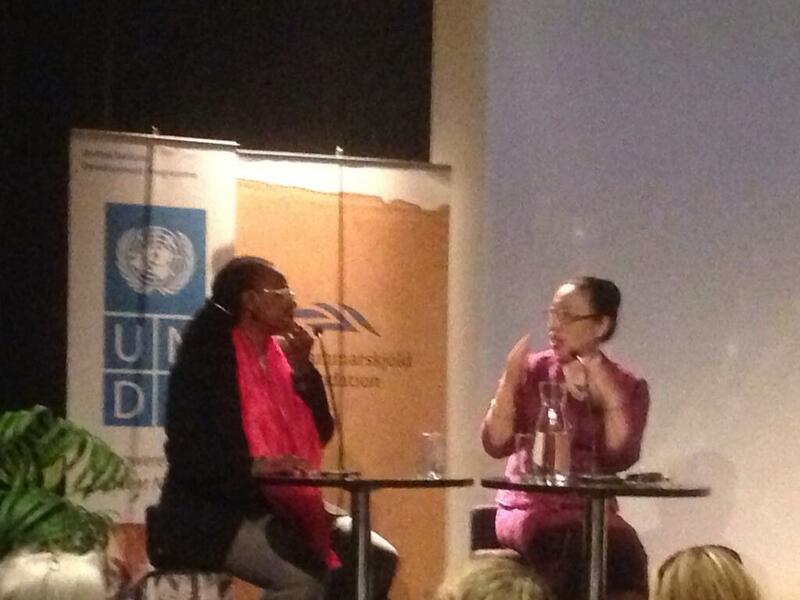 Hosted by UNDP and the Dag Hammarsköld Foundation, in Stockholm, it featured two powerful women speakers: Sakiko Fukuda-Parr, former director of the UN’s Human Development Index and now a professor at the New School in New York; and Mariama Williams, a senior researcher at the South Centre. I tweeted this seminar three times, and used words like “brilliant” and “inspiring,” even though the presentation slides were terrible and neither speaker was a spectacular orator. But their analysis was incisive, compelling, their way of presenting was genuine and direct, and they forced one to rethink even old thoughts in new ways. I have not read the papers yet, but I plan to, and assume/hope that I got the basic message from Fukuda-Parr herself. Having listened to so much cheer-leading regarding the MDGs, which I do personally think have been very useful, and watching the formation now of the Sustainable Development Goals (SDGs) with some concern and worry, Fukuda-Parr’s critical skepticism was like a breath of fresh air into the dialogue. Especially as it came from the former director of yet another mega-indicator, the Human Development Index! Ah, but what to do? No real answers here from Fukuda-Parr, except some “do nots”, like “Don’t take the indicators literally.” She advocates more the messy, paradoxical dialogue, than the clear, goal-seeking mega-indicator. This appeals to the intellectual, but not to the manager. Mariama Williams had a different take, focused on the next-to-impossible challenge that she summed up (verbally) this way: There is a big development gap + there is a huge debt overhang in the developing world + we have reached or exceeded the planetary ecosystem boundaries + there is a huge mitigation gap on climate change so the world will eventually be steaming + there are occasional disasters in poor areas that reverse years of progress. Williams, like Fukuda-Parr, didn’t have answers, nor did she promise any. She had excellent answers to question though, from the audience, showing how the political dialogue around the MDGs and other topics had effectively deflected any serious grappling with structural inequalities in the world. Both women agreed that equality had sunk lower on the political dashboard because of the way these goals and measures are handled, instead of being raised up higher. And important stories had gotten buried: China, for example, has succeeded on so many development indicators by *not* following the Washington consensus, which few wish even to speak about, while Brazil used serious labor policies to both protect workers and create jobs in a vibrant economy, something that again falls far outside of the neo-liberal consensus, but is (unsurprisingly) overlooked. 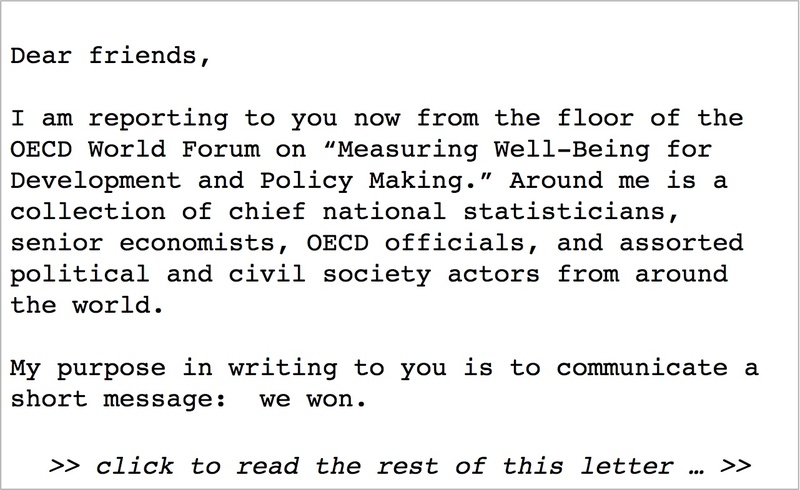 I am reporting to you now from the floor of the OECD World Forum on “Measuring Well-Being for Development and Policy Making.” Around me is a collection of chief national statisticians, senior economists, OECD officials, and assorted political and civil society actors from around the world. My purpose in writing to you is to communicate a short message: we won. I do not mean, of course, that we have “won” the “fight” for a sustainable future. Far from it. What I mean by this is something very narrow and specific, and concerns the fight to convince policy-makers that the GDP should not be the central measure of progress. This is a fight that many people have been involved with for many years, going back to the late 1980s. Why do I say “we won”? Because at this conference are many people whose job is to prepare the national and global statistics that inform those policy-makers, as well as a number of actual policy-makers. The consensus among those attending this Forum is clear: these new measures of overall quality of life as well as subjective wellbeing (“Gross National Happiness” and its many imitations, under many names, now in dozens of countries) have become fully mainstream — and they might even challenge GDP for supremacy in the coming years. Programs to develop and launch and use these new indicators in policy-making are now happening in dozens of countries, and they are clearly on the rise. The commitments are serious and appear to be long-term. Virtually everyone at this event, from the head of the OECD to national statisticians, seems to agree that GDP is no longer adequate, and in fact can be dangerously misleading. In political terms, the OECD is rather more progressive than some other international organizations; it is certainly more progressive than the WTO, for example. So a consensus within the OECD does not mean “everyone” in political power, by any means. But, especially as compared to the small think-tanks and academic centers that have championed these ideas, the OECD is unquestionably at the heart of the policy world, and a good indicator of “mainstream-ness”. Australia, France, China, Mexico, several African countries, Indian states, and dozens more … This is critical mass. There’s another important factor that convinces me that we have won. Many of these national statisticians are saying — from the podium as well as in private conversations — that they see the future of their profession moving this way, and they want to be on the train. “We’re a conservative bunch,” one of them said to me, “and that adds to our credibility. But now we see that these new measurements have reached a point where if we don’t get on that train, we might become less relevant.” And they want to be more relevant, not less. Expanding the kinds of measures that reflect national progress is actually good for their careers, good for their budgets, and good for their overall political standing. What’s more, it makes good sense to them now. So, especially if you are someone who remembers those old indicator projects and meetings and reports from the early 1990s and afterward … take a moment and mentally celebrate. We started pushing this rock up the hill a long time ago (taking over from those who pushed before us) … and more and more people joined in … and now it is over the hump, and appears to be rolling on its own steam. Despite all the economic and political turmoil of the past year — from the Arab Spring to the Great East Japan Earthquake, from the “Occupy” movement to the near-meltdown of the Eurozone — a quiet revolution in economic thought has continued to gain steam. 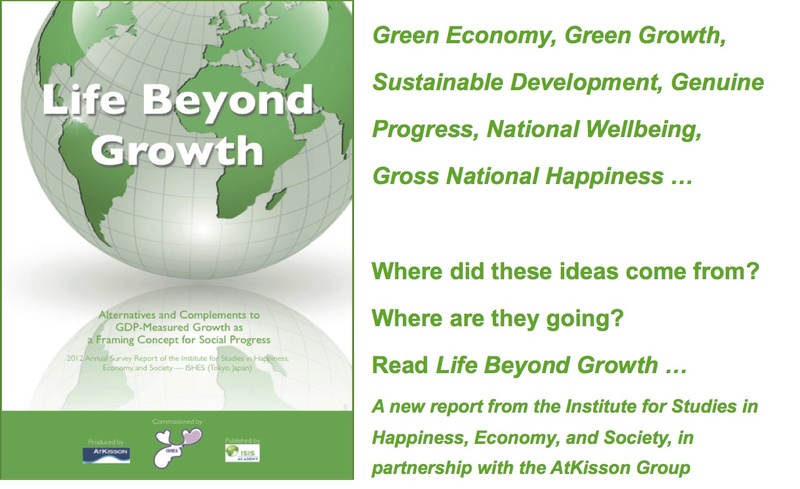 Concepts such as “Green Economy,” “Green Growth,” “Gross National Happiness,” and even “National Wellbeing” have governments around the world exploring new ways to frame, and measure, the idea of national progress. Most recently, the United Nations formally joined the conversation, with its own high-level panel calling for “new ways to measure progress” in advance of the Rio+20 global summit. Commissioned by the new Institute for Studies in Happiness, Economy, and Society (ISHES) in Tokyo, Life Beyond Growth was written to help people (especially decision-makers) come to grips with the sudden rise of these new ideas, frameworks, and alternatives to the GDP as the sole measure of “Growth as Usual.” Meant to be the first installment in an annual series of reports, Life Beyond Growth 2012 traces “the evolution of a revolution,” from the origins of traditional economic growth to the present day rise of the candidates to replace it, or complement it, as the principal goal of national development. Life Beyond Growth also takes a geo-political look at ideas like Green Economy (popular among environmentalists) and Green Growth (embraced especially by dynamic Asian economies such as South Korea) and maps out their future prospects: Who promotes them? Who is adopting them? Where are they gaining traction or meeting resistance? And what is the impact of trends such as the rise of Corporate Social Responsibility, the protests of the Occupy movement, the persistence of armed conflicts, or the upsurge in United Nations activity tied to the Rio+20 summit? Life Beyond Growth attempts describe and even visualize these influences, and come to some conclusions. Will measures of “Green Growth” replace the GDP in the future? Or will “Gross National Happiness” and indicators of national wellbeing eventually take an equal seat at the table? The authors and sponsors of Life Beyond Growth do not pretend to know the answers in any definitive way. But after a review that attempts to be thorough, balanced, and sympathetic, the report does take a stand. The complex global realities of our time, where one billion lead charmed lives and another billion live extremely deprived ones, demands a differentiated view. Some concepts logically, and ethically, hold more meaning for some groups than for others. But in the end, says Life Beyond Growth, a consensus does seem to be emerging: we should all be aiming for a world that is environmentally green, economically secure, and happy, for all. Does that sound visionary? It should: if there was ever a time when the world needed a clear consensus on a new economic vision for the future, that time is now.